Every Wednesdays, our local library has a kids crafts class and they have a different theme each week. This week their theme was Islam. The librarians asked me to host it, and share my experiences as a Muslim with the kids and the moms. I read a few Muslim nursery rhymes and explained some of the basic Muslim/Islamic terminology. (Example, that "Allah" is just an Arabic word for God.). After I finished reading, the librarians and some of the moms asked me various questions about my religion and about my headscarf. Questions like, "Do you have hair or are you bald? ", "How long is your hair? ", "Do your scarves have to match your clothes? ", "How many times do you pray? ", and "How long is each prayer?". After I was done answering everyone's questions, we did some Islamic art. 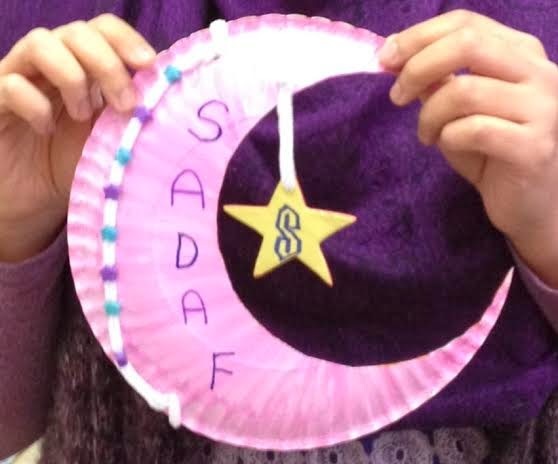 We used paper plates to make crescent moons out of them. Then we used pipe cleaners to dangle a star from each moon. The kids used markers and sparkly beads to decorate their moon and star. I was very nervous at first, but it seemed like it went okay! Below are some of the things I took with me to show everyone. On the left are some of my different coloured headscarves. 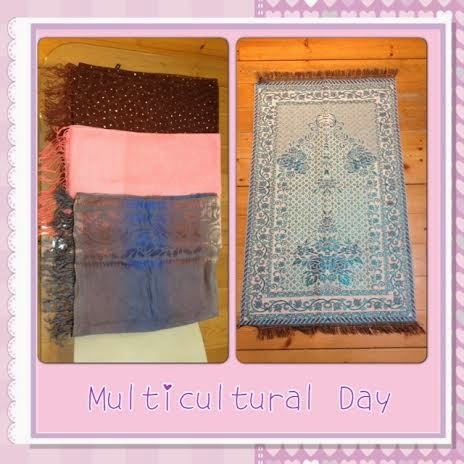 And on the right is one of my favourite prayer mats, which my parents bought for me from Turkey. This particular one is actually reversible.